مطالعه نهشته‌های دونین پسین-کربنیفر پیشین در کرمان منجر به شناسایی بیش از چهارده تاکسا از قطعات میکروسکوپی ماهی‌های غضروفی Chondrichthyes)) در این منطقه گردید. فراوانی قطعات به‌خصوص در نهشته‌های فامنین قابل توجه بود. فراوانی قابل توجه protacrodonts و phoebodonts خاص فلات قاره کم‌عمق نسبت به انواع عمیق‌زی، بیانگر عمق کم محیط رسوبی در زمان فامنین می‌باشد. 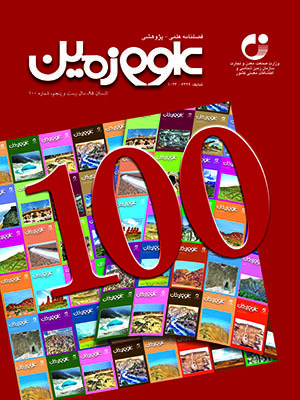 مجموعه کندریکتین‌های فامنین برش هوتک با زیای موجود در برش چاهریسه اصفهان قابل مقایسه می‌باشند که حاکی از شرایط یکسان محیطی در زمان فامنین در حوضه ایران مرکزی است. حضور گونه Deihim mansureae در لایه‌های duplicata Zone نشان می‌دهد که گستره سنی این گونه تا تورنزین پیشین ادامه می‌یابد. 1Assistant Professor, Department of geology, Payame Noor University (PNU), Iran. 3Assistant Professor, Department of geology, Hormozgan University, Bandar Abbas, Iran. .
4Associate Professor, Department of geology, Shahid Bahonar University of Kerman, Kerman, Iran. 5Professor, Department of geology, Kerman institute of Higher Education, Kerman, Iran. From Late Devonian-Early Carboniferous strata in the Kerman area fourteen chondrichthyan taxa were identified. The abundance of chondrichthyan teeth in Famennian strata is considerable. The high abundance of protacrodonts and larger proportion of shallower shelves of pheobodonts appeared to dominate in a shallow environment at the Famennian. The chondricthyan assemblage from the Famennian of the Hutk section resembles the Chahriseh fauna in Esfahan district that reveals similar palaeoenvironmental conditions in Central Iran basin. The occurrence of Deihim mansureae in duplicate Zone marks the youngest record for the species up to Early Tournaisian.